Some thoughts occurring while waiting for the time to get dressed in the finery. Skimpies really, which is why I’m putting it off in case I catch a cold while waiting for cousin Pam to pick me up at 6.45pm. One aspect still remains to be seen – will the frock fit? It is quite slinky but has no zip which means I don’t need to worry about closing it and getting out of it when I get back home. Will I look like Wurst when it’s on… I have no plan B. Maybe I should have been fasting since last Monday at least. Two days without wine hasn’t made any difference. The Michelin Man feature is still there. We always celebrate our Christmas on Christmas Eve which is the Finnish and Continental way. No1 Daughter cooked the dinner this year and Katie and I are still eating gammon. Giving presents to the children was done differently this year. They got presents over two days, starting in the morning of the 24th and continuing on 25th. This way they enjoyed all the presents, instead of it being a frenzy of opening parcels all at once. It also gave the parents chance to write down who gave the presents. Other than Father Christmas of course. Pleased to report the frock fitted and as long as I was breathing in when standing up I looked reasonably slim. Ships passing in the night… Well, it was day time. The day was progressing well. I had done some work in the morning, went town to get the paper, saw No1 Daughter. On the way home I went to the beach with the mutt. It was glorious. It was sunny and calm all day and on the beach it was almost warm. Coming home I considered a couple of rounds of archery but decided not to, too many ‘necessary’ things to do. I wouldn’t be at ease doing it. After lunch I carried on working. There was a knock on the door. Two men stood there smiling. Oh no! Mormons, was my first thought and I was preparing for a very short acquaintance. It turned out to be something better. These two were father and son, all the way from America, to come and see Bankhead. This is what the Americans seem to do a lot, to visit the ancestral seat. I was baffled until the whole thing unravelled. I thought they were checking every place called Bankhead… The father had been doing research into the family and came to the conclusion that this had been the place where his ancestors came from in the 1600 and something. He showed his driving license and there it said – (something) Randolph Bankhead. I told them everything I knew about the place. This is called Bankhead because this is where the two banks join, on both sides of the burn which runs in a gulley (I think…). When we bought the house in 1980 the surveyor said there had been a house here for about 300 years but this house was only 130 years old, which kind of tallies with the dates the man had. What an interesting pair. The father said he is an architect and the son said he repairs airplanes. The father said he lives in Senegal during the winter, showed me a photie of his house there and the son showed me photo of an old VW campervan he was doing up – seemed to be doing it in a large hangar. One is nowadays very cynical about everything and anybody but this was too odd but nice to be classified as a fraud. I now wish we had at least exchanged names, if not e mails. We talked perhaps an hour. They never asked what my name is, maybe they already knew. Nice, interesting encounter nevertheless. They had a cracking sense of humour, they were quick witted, very well informed about the world outside the US of A, we had a lot of common subjects to talk about. We could have talked for hours but they had to return the hire car and fly somewhere that night. Altogether life is good at the moment but this kind of thing is a lovely extra to the usual. The news is that I will be in the Spring Fling next May. I needed a bit of …eh…encouragement to get myself working again. Now I have a list of works to make. I have works to assemble first which would make space for more works to be made. Getting ideas has been the biggest stumbling block. No ideas, no motivation, no aim in life for a while. I was adrift without an anchor, a bit. I feel happier now. There are people who out of sorrow, sadness, depression, turmoil, create the best works of their life. Not I. I have been very good at moping around, procrastinating, faffing about. Now I must get on with it, to get stuff ready for galleries and the Spring Fling. This has been an interesting week. I wouldn’t say I’d like to repeat it though. On Monday late at night I discovered the radiators were cold. Pressed the button at the burner. Whirrr – nothing. I was already in pyjamas and dressing gown and went to take the oil level. I had run out of oil. Of course it was going to be the coldest night of the winter. It was already minus 2C. I phoned the oil company and left a message asking to deliver asap. I phoned again in the morning and they had got my message and were going to deliver that day. A friend visited, thought he could help if the system needed bleeding but the oil didn’t arrive in time. I was away for half an hour for a dog walk and of course oil was delivered while I was away. I had to phone a plumber friend who came straight away and sorted the air lock. Blessed warmth filled the house again. I was happy. For so many years I had been cold every winter, trying to save the environment, and money, and now decided being this old it was time I was warm. Yesterday, Wednesday, I went for an eye check up at the Dumfries hospital. What was supposed to be just a check up turned into an event. I had mentioned that two-three days ago floating small spots appeared in my whole area of vision. I could see perfectly well but looking at a pale blank space it was a mass of floating wee spots. After three lots of drops and checks with the machinery the Doc said I had a small tear in the retina, causing the blobs. I’ll be needing another appointment, I thought. Apparently it had a good chance of becoming a detached retina so action was needed soon. It needed ‘welding’ with laser. He said he can do it now. Wow! Impressive or what. I was last in the waiting room so perhaps that helped. The miracles of modern science and skill of the man. The whole procedure wasn’t too bad at all. In the evening the eyes felt a bit itchy, like when you are very tired. It was a good excuse to go to bed early to rest the eye. Well both of them got a rest. Today eyes were back to normal. Even the wee spots more or less had disappeared even though the Doc had said they’d take a long time to disappear. The only slightly negative side is that I can’t dance until they have checked the repair in a couple of weeks time. Just as well I phoned the hospital to ask about it. 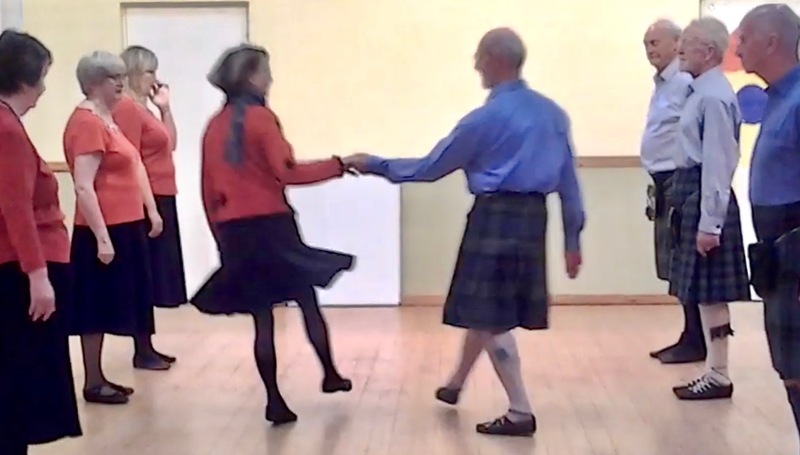 I’ll be going to the Country Dancing Burns Supper dance on Saturday but I’ll be only watching. Blast. Still, I wouldn’t want to ruin the man’s good work. I can’t but heap praise on the ophthalmic department staff. They are all very efficient and friendly. Cousin Pam was my dedicated driver and just as well, the world was a blur on the way home.